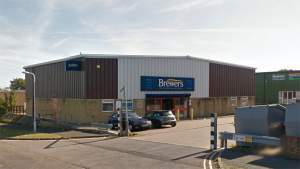 The Brewers Decorator Centre in Folkestone, Kent, is a well-known source of paint and decorating suppliers to tradespeople and private customers alike. We stock a large array of wallpapers, with thousands of patterns to choose from. We also carry trade and designer paints in bulk, plus all the tools, accessories and equipment needed. Our team are always happy to answer questions about each product or set you up to browse. Our store also has a kids’ area where children can play while you shop. Because we’re on the Park Farm Industrial Estate, there’s lots of customer parking and the showroom is easy to use for those with limited mobility. We’re a very short drive from junction 13 of the M20 via the A259. Head down Kingsmead from Park Farm Road and we’re a couple of hundred yards down on your right. Travelling on the east bound M20, exit at junction 13 and at the roundabout take the fourth exit, at the next roundabout take the first exit. Continue along the A259 Churchill Avenue and at the roundabout take the second exit on to Park Farm Road. At the next roundabout take the first exit and then the first turning on the right on to Kingsmead. Travelling west bound on the A20 Hollywell Coombe Viaduct, exit at junction 13 and at the roundabout take the first exit and continue along the A259 Churchill Avenue and at the roundabout take the second exit on to Park Farm Road. At the next roundabout take the first exit and then the first turning on the right on to Kingsmead.